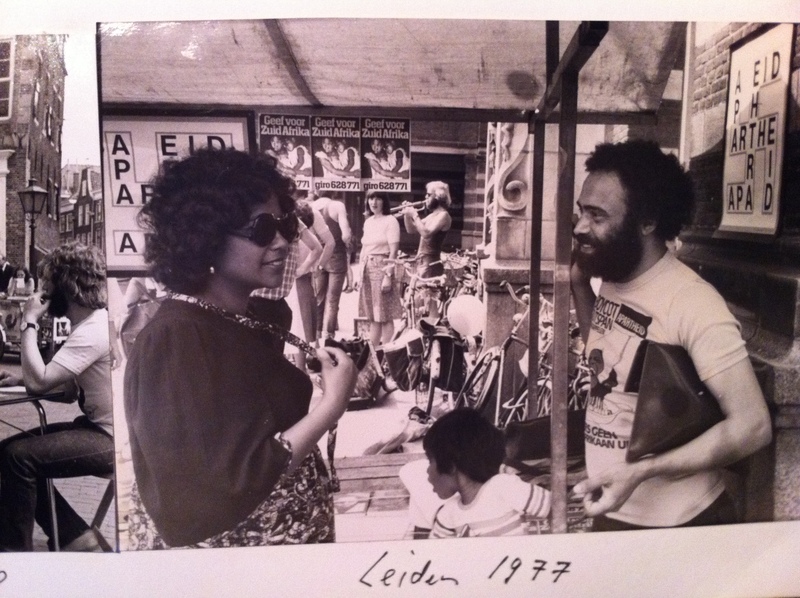 Despite their relatively small size in comparison to other Dutch anti-apartheid organizations of the era (with only two full time paid employees and between ten and twelve volunteers), I believe that the BOA were one of the most influential anti-apartheid and anti-racist organizations in Europe during the 1970s. Until now, little has been written on the BOA in either Dutch or English, “save a small and largely inaccurate entry by Sietse Bosgra” (du Plessis, 2012) in the SADET publication on the global anti-apartheid movement, and a chapter that dedicates a few pages to the BOA in the Geographies of Commodity Chains (2004), by the geographers Charles Mather and Petrina Rowcroft. 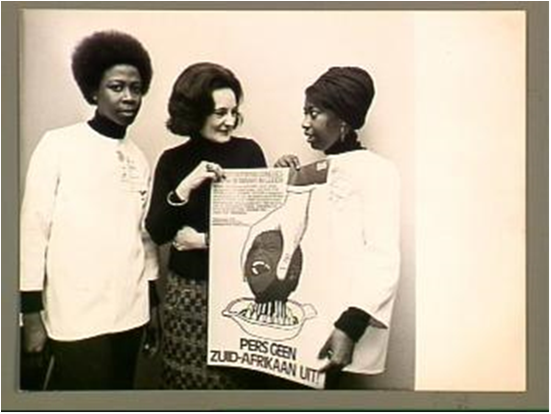 Mather and Carla Mackenzie write about the BOA’s ‘Inspan Girls’ in a paper on the Outspan Girls marketing campaigns, but they attribute the campaign to the wider Dutch anti-apartheid movement rather than the BOA. There are interesting reasons for the lack of coverage on the BOA that I address in my thesis. In time, I believe this will change – the BOA was remarkable for its success as a boycotting organization, unique in the Netherlands for its ‘whole world’ approach to racism and apartheid, and publicly compelling for its innovative culture jamming campaigns and media work. BOA campaigns in the 1970s and 80s were based on the worldview that totally rejects racism as described by the Dutch scholar Karel Roskam (he later became an enthusiastic supporter of the BOA) who in 1960 published the seminal work, Apartheid and Discrimination. Click on image for link to Martin Leggasick’s chapter on ‘British Hegemony and the Origins of Segregation’ (1995). Leggasick positions Roskam’s thesis as a major influence on the historiography of racial segregation in South Africa. Karel Roskam. Radio presenter and anti-apartheid theorist. Please click on image for a short biography. Across their three major public projects (the boycott of Outspan citrus, the anti-emigration campaign, and the urban town campaigns) the BOA left their distinctive mark. To the chagrin of some development groups and a few other Dutch anti-apartheid organizations, the organization refused to separate apartheid in South Africa from everyday structures of racism in the Netherlands. To the BOA, apartheid was a logical, if wholly lamentable, extension of European racism. And evidence of European racism could be found in the attitudes and beliefs of many Dutch people. 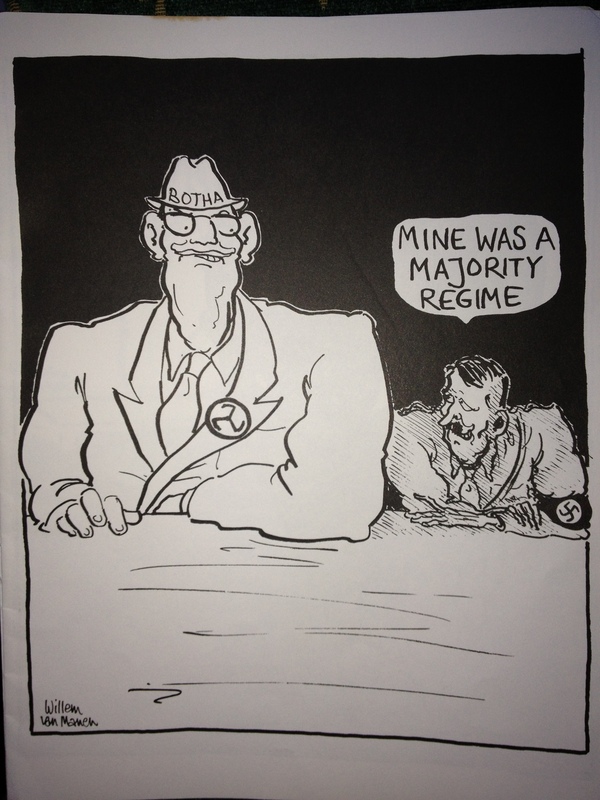 This implicating ideology was interpreted by some as too radical, the BOA’s open criticisms of the Den Uyl administration for its social and economic links with South Africa led other anti-apartheid activists to weakly accuse the BOA of duplicity (they were partly funded by a government grant). In 1972-73 the BOA unleashed the blood-citrus topos on the Dutch public. Through the publication of one highly controversial image, the BOA awakened the power of anthropophagic suggestion and contaminated the idea of eating and drinking citrus from apartheid South Africa. The cartoon below, by BOA graphic designer Rob van der Aa, is arguably the most effective food boycotting image of recent European history. 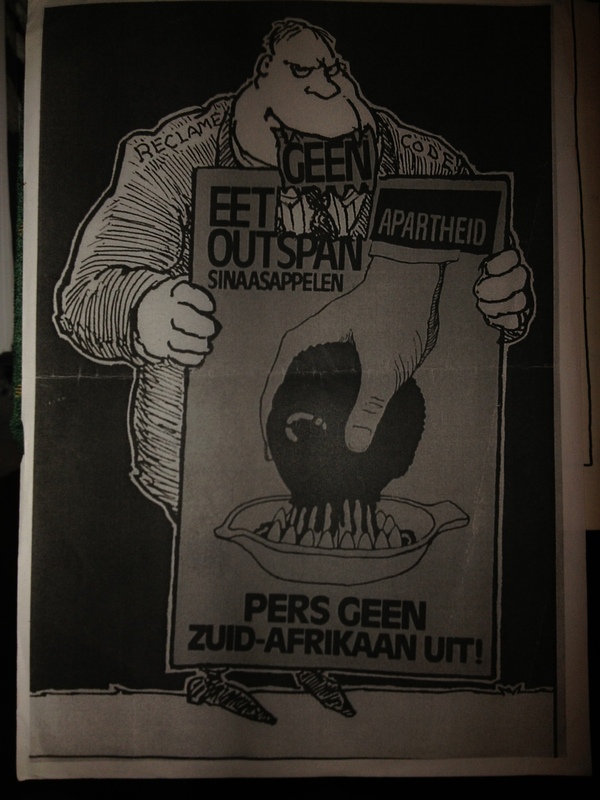 Its success can be measured threefold: by the complete withdrawal of Outspan oranges and grapefruit from the Dutch market (previously the fourth largest captive market for Outspan citrus in Europe); by the image’s many imitations across other anti-apartheid movements; and by the legal banning of the image’s reproduction in Holland from 1973-5. The legal contest over the BOA’s central motif was framed in the national press as a debate over the freedom of expression in Holland. The publicity yielded huge boycott potential; the main Dutch supermarkets (Albert Heijn, The Spar, De Gruyter, Vroom en Dreesmaan) buckled to BOA demands days after they were threatened with wholesale boycotts of their stores. “Whatever is done to the image is somehow done to what it stands for…Indeed images are sometimes treated as pseudopersons – not merely as sentient creatures that can feel pain and pleasure but as responsible and responsive human beings. Images of this sort seem to look back at us, to speak to us, even be capable of suffering harm or of magically transmitting harm when violence is done to them” (Mitchell, 2005: 127). 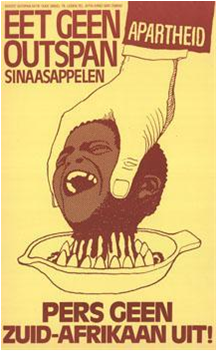 The squeezing image was an accusation of European complicity in apartheid through the purchasing and consumption of Outspan citrus. Oranges were effective tools for the BOA to induce gut feelings of guilt and complicity. The material properties of the orange (with its fleshy water drenched interior and hard exterior prone to rapid dehydration once separated from the flesh), made it an obvious contender to mimic the environmental conditioning of human bodies. The husk provided a metonym for drought or thirst and a metaphor for bone, and orange segments provided a metonym for quenching and metaphors for human flesh and blood. What is more, the essential quotidian violence (Probyn, 2000) required to eat or drink an orange (squeezing, dissecting, peeling, segmenting, sucking, grating) was adroitly applied by the BOA to the social and spatial squeezing of the labourer and the famine victim, and the dissection and segmentation of the entire non-white South African population. The apartheid orange belonged to a “harvest of shame” (BOA, 1973). “First of all a note regarding the poster of the Boycott Outspan Action. I have heard many reactions to the poster. Some have said that it’s a bit too cruel, others that it was exactly the way it should be. When I look at this image of the hand on the head of what appears to be a child, I think that this hand is not doing what it should be doing. He should squeeze a bit harder, because that is in fact what I think is happening in South Africa. And I believe that the hand itself should show how tense the muscles are as they squeeze the life out of our people” (James Phillips. Translation, BOA Dokumentatiemap 2, 1973: 15). The BOA’s work was innovative, provocative and meticulously planned. At the height of the Outspan citrus boycott they engaged a huge public with over 70% of Dutch people aware of their actions. They aimed at incorporating the ‘lowest threshold’ (a term that they used to encompass the Dutch white working class and the apartheid labourer) in their actions. The multinational BOA ‘Inspan Girls’ with Ruth First, 1973. Click over image for information on the CAO. 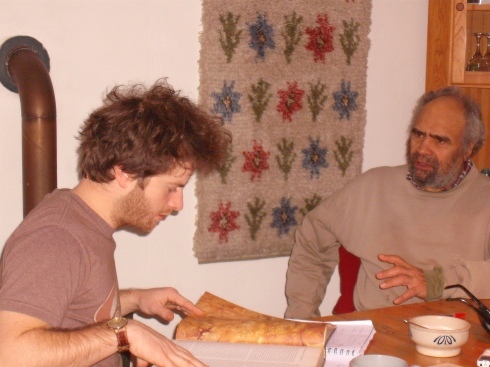 In the summer of 1974 du Plessis made frequent trips from Leiden to Paris and founded the French version of the BOA, the CAO (Campaigne Anti-Outspan) with a Frenchman, Bernard Taillefer, who had read a French translation of the 1973 BOA Bulletin. Through utilising the BOA’s motif and slogan, and transferring its action models, the CAO became France’s first anti-apartheid organization. With graphic designers, lawyers, and exiled poets among their number, the BOA could draw on plenty of creative inspiration. Their professional lawyer, Willem Van Manen, was also a talented caricaturist who helped develop the BOA’s image into the 1980s. The Reclame Code Commissie (RCC), an advertising standards board launched an injunction against the BOA poster due to its supposed indecency, and for two years the squeezing image was officially banned from publication. This gave the image, and the BOA, a subversive edge, and drew sympathetic publicity from the liberal press. Van Manen (1975) suggests that the RCC were doing the dirty work for the South African president, Hans Botha. ‘Constructive Engagement’. Van Manen 1988. Courtesy of du Plessis. Van Manen (1988). Courtesy of du Plessis.